Pancreaticoduodenectomy is a complex surgery frequently associated with prolonged hospitalizations. However, there are a subset of patients discharged within 5 days from surgery; the preoperative and intraoperative characteristics of this subset are unknown. The NSQIP Targeted Pancreatectomy Dataset was used from 2014 to 2016. Patients who died within 30 days were excluded. A total of 10,741 patients undergoing pancreaticoduodenectomy were identified. Univariable and multivariable logistic regression analyses were performed for preoperative and intraoperative ACS-NSQIP variables to identify predictors of early discharge. Early discharge was defined as discharge 3–5 days after surgery. 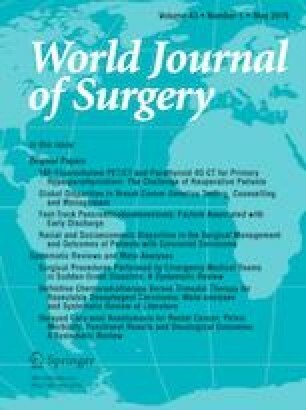 A total of 1105 patients (10.3%) were discharged within 5 days following pancreaticoduodenectomy. On multivariable analysis, preoperative factors associated with early discharge included younger age (OR 0.988, p < 0.001), non-obesity (OR 0.737, p = 0.001), those receiving neoadjuvant chemotherapy (OR 1.424, p < 0.001), and lack of COPD (OR 0.489, p = 0.005) or hypertension (OR 0.805, p = 0.007). Intraoperative factors associated with early discharge on multivariable analysis were shorter operation duration (OR 0.999, p = 0.002), minimally invasive surgery (OR 3.537, p < 0.001), and hard pancreatic texture (OR 1.480, p < 0.001). Intraoperative factors associated with non-early discharge were epidural placement (OR 0.485, p < 0.001), drain placement (OR 0.308, p < 0.001), and jejunostomy tube placement (OR 0.278, p < 0.001). Patients discharged within 5 days had a 14.7% readmission rate compared to 17.0% for later discharges (p = 0.047). Multiple preoperative and intraoperative factors, including some that are potentially modifiable, were significantly associated with early discharge after pancreaticoduodenectomy. Patients with these characteristics may benefit from enhanced recovery after surgery programs and expedited disposition planning postoperatively.